This next post in a series demonstrating physical & mathematical proofs why Maxwell's atmospheric mass/gravity/pressure (33C) greenhouse effect is the only correct explanation of the greenhouse effect will now show why the entire physical basis of the competing anthropogenic global warming theory (now out of necessity called "man-made climate change" since it hasn't warmed for 18-26 years), somehow conveniently ignored the well-established basic and atmospheric physics, physical chemistry, and barometric relations that had been well-established for more than the past two centuries, and effectively hide this in their overheated & untouchable black-box computer models. The models then serve the purpose of providing a veritable & impenetrable safety deposit box of ancient Fortran computer code, completely secured from inspection by anyone who doesn't have the key, or understand poorly-documented Fortran. The CAGW computer modelers also completely ignored the hundreds of physicists, atmospheric and rocket scientists, physical chemists, and other scientists who just a decade earlier (during the 1970's ice age scare) provided the immense, overwhelming physical, chemical, and observational proof of the gold standard 1976 US Standard Atmosphere calculations and the first computer model of the atmosphere (and the only model which has been verified with (millions) of observations), offering overwhelming evidence that greenhouse gases have no significant "radiative forcing" or "radiative imbalance" effects upon the Earth's atmosphere whatsoever, from the surface to edge of space. The Standard Atmosphere model does no radiative calculations from greenhouse gases or other gases, since these hundreds of scientists had previously established any such effects to be negligible. 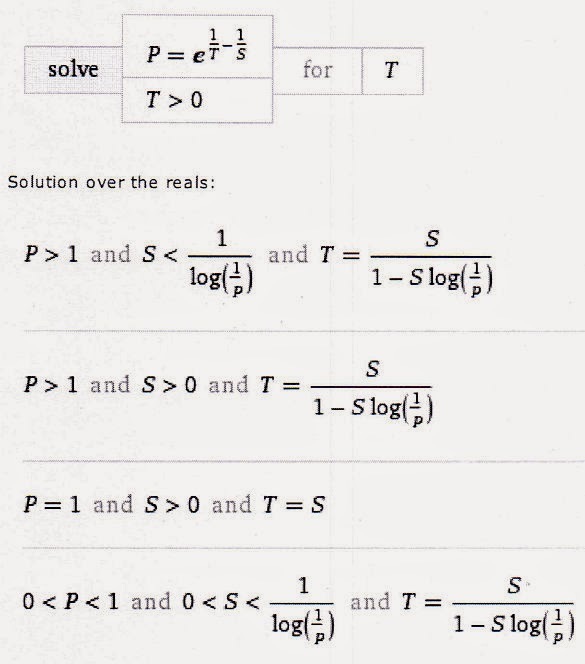 The calculations and std. atmosphere model do not ever utilize the absolutely essential Stefan-Boltzmann equation, nor any absorption/emission spectra from any IR-active gases at all to determine temperatures from "radiative imbalance," or "heat trapping," or "radiative forcing from greenhouse gases." Bad things can happen when climate modelers conveniently ignore over 200 years of well-established physics, including confusing a cause with an effect, but that is unfortunately what has happened. We will now show additional reasons why man-made or natural CO2 cannot be the Earth's climate control knob, demonstrating how the IR emission spectra from greenhouse gases are simply an effect of and not the cause of the mass densities/gravity/pressure/viscosities of all gases present in each layer of the atmosphere all the way from the surface to the edge of space, which in-turn are entirely responsible for the resulting temperatures (via the Ideal Gas Law and other physical laws) at every altitude, not IR backradiation from passive IR absorbers/emitting gases (so-called "greenhouse gases" for the first time a decade later). The cause must always precede the effect, and the cause never follows the effect. As the greatest physicist in history on the topics of radiation and heat, J Clerk Maxwell, wrote in 1872, the atmospheric temperatures and gradients are a function of and caused by atmospheric pressure/density/specific heat capacity of the particular gases in the atmosphere, not the other way around as falsely assumed by CAGW proponents and the falsified & overheated climate models. The climate modelers claim, however, that passive IR absorbers/radiators greenhouse gases somehow add 33C of heat energy to the planet to the 255K already provided by the Sun, causing the 255+33K = 288K surface temperature. However, they never mention (for very good reasons) that the US Standard Atmosphere above and observations show the troposphere also has an even greater 35C negative greenhouse effect from 255K falling to 220K at the top of the troposphere. How can any greenhouse gas allegedly "know" that it is supposed to heat only the troposphere by 33C below ~5100 meters altitude while simultaneously cooling the remainder of the troposphere by 35C from ~5100 - 11,000 meters altitude? 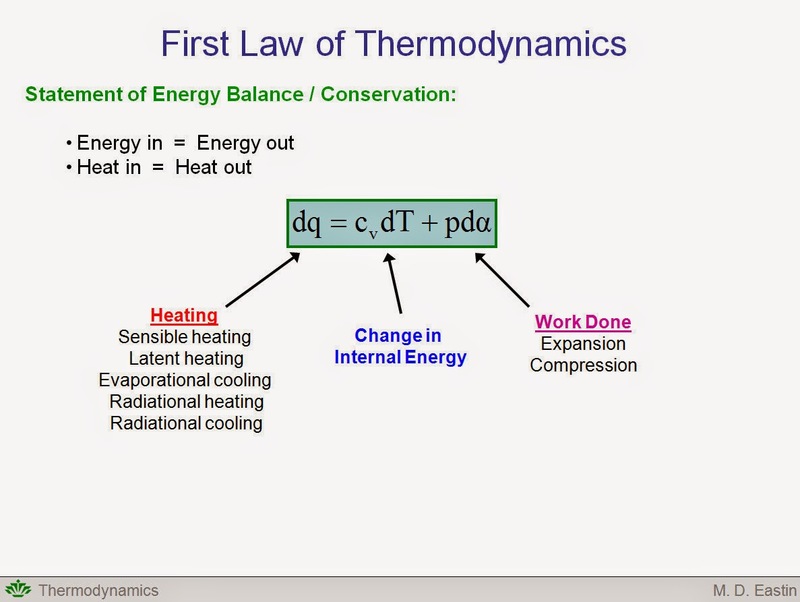 They cannot, nor can computer models, without violating the 1st and 2nd laws of thermodynamics, and common sense. thus the temperature is a function of and an effect of gravity/molecular mass, not the other way around from greenhouse gas "radiative forcing" or "backradiation." 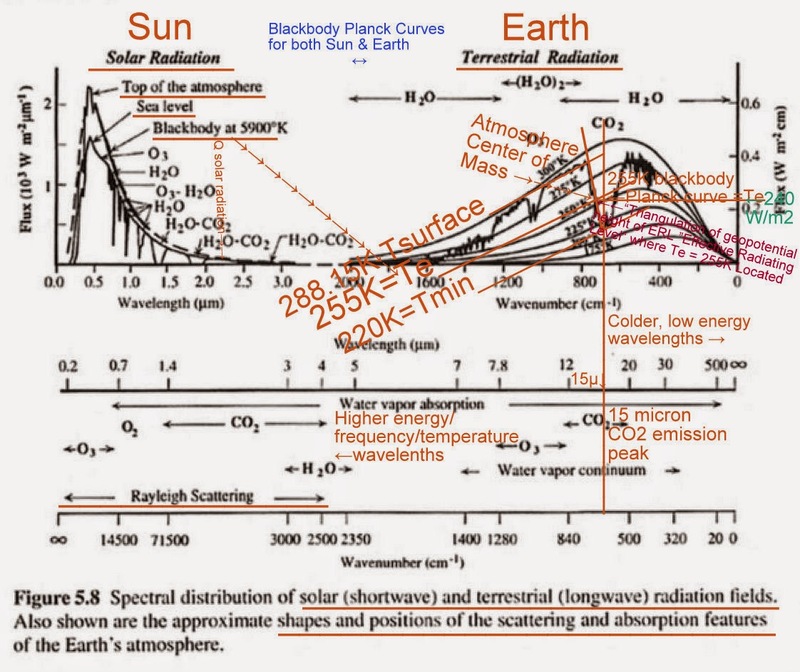 Irradiance or "backradiation" from greenhouse gases is in turn a function of the 4th power of temperature (by the Stefan Boltzmann equation), not the cause of the temperatures to begin with. The cause absolutely cannot follow the effect. Mass/gravity/pressure cause the Maxwell greenhouse effect and lapse rates, which causes the resulting temperature, which in-turn causes the greenhouse gases at each atmospheric temperature thus established to passively radiate IR at the above blackbody curves and absorption/emission spectra, not the other way around. You cannot have it both ways. One and only one 33C greenhouse effect theory can be correct, not both since otherwise the surface would be at least 33C warmer. The diagrams are not from Goody and Yung but are consistent with their work going back at least 30 years. 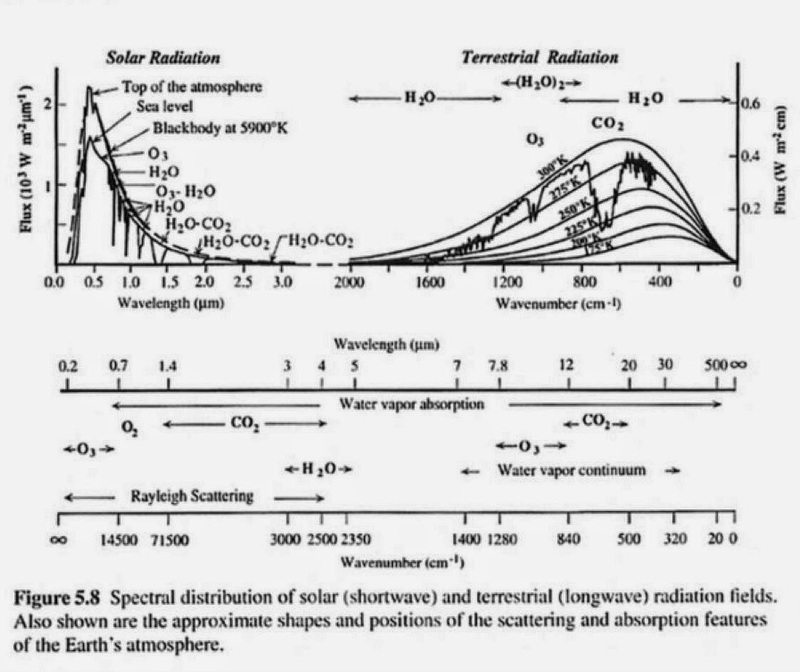 Atmospheric Radiation: Theoretical Basis, Goody and Yung. OUP, 1989 reprinted 1995. What this post shows is the Goody and Yung's theoretical framework, largely based on quantum physics is consistent with the classical physics of Maxwell. The arguments here and those elsewhere on the internet concerning the "gravito-thermal theory" do not demonstrate that the quantum approach is right or wrong or that that the gravito-thermal theory is right. It shows that the theories are mutually consistent. One apparently is consistent with classical physics, the other with modern physics. This is a useful and interesting result but is irrelevant to what causes global warming and cooling. Now that certain AGW promoters within NASA have retired, other NASA scientists and their colleagues are showing us that there is little or no evidence for the scare stories about CO2. They do it, not by theory but by good old empirical analysis of observations. If you don't like the authors comments, just ignore them and read the papers. Assuming the Maxwell gravito-thermal theory is correct means only changes in solar activity and albedo affect climate, not CO2. And by incredible coincidence Miskolczi just posted notice at Tallbloke's talkshop of his new paper published online that confirms AGW "radiative forcing" is a complete illusion, shows exactly where Trenberth et al went wrong & fudged the models opposite of observations. It is an absolutely fantastic paper that I'm writing a new post about now, which corroborates the US Std Model, and indirectly corroborates and confirms everything I've been posting on the "greenhouse equation" & thus Maxwell's mass/gravity/pressure GHE theory is absolutely correct from a radiative perspective as well. Thanks again ren for providing yet another great illustration from satellite observations confirming the points I'm trying to make! Please continue to send any other links to helpful illustrations for inclusion in future posts or comments, and any thoughts you have on refining or illustrating the theory. Thanks much again and best regards! These articles are great, showing that changes in CO2 do not effect the lapse rate but the question still remains as to how LWIR absorption band energy gets radiated off this planet in deference to the AGW theory that is being taught in the schools. I have a problem with most explanations of the greenhouse effect in that they are just plain wrong. For example, according to some of the explanations of AGW theory, greenhouse gases in the Earth's atmosphere act as much as a 90% reflector causing warming of the Earth's surface by greenhouse gases but this cannot be right because greenhouse gases are suppose to be LWIR absorption band absorbers and not reflectors. Good absorbers are also good radiators. Greenhouse gases do not really trap heat, Instead they diffuse absorption band LWIR radiation to space. They radiate as as function of their temperature, Their temperature depends not only on the radiation they absorb but on the temperature of the gas that surrounds them and that temperature on average is governed by the lapse rate that does not depend upon the amount of CO2 in the atmosphere. Within the atmosphere, heat energy transfer by LWIR absorption band radiation is trivial compared to convection and H2O phase change. To more successfully argue against AGW I need better information as to how energy is radiated off the planet. Pinning the 0 degree F equivalent blackbody radiation to mid way in the atmosphere may be correct but it seems somewhat arbitrary and difficult for me to argue to believers in radiation theory. I need to have a better understanding as to the process of the Earth radiating to space particularly in LWIR absorption bands. Of course there is no black body radiating to space at an equivalent altitude of about 17k feet. I would think that because of the low emissivity of the clear atmosphere that the actual radiators are warmer and at lower altitudes. We are talking about altitudes where clouds form and where heat is transported from the earth's surface by H2O via the heat of vaporization.